Lib Dem Manifesto 2019 Dacorum Elections. Adeyfield West Candidate - Adrian England & Ron Tindall. Boxmoor candidates - William Allen, Claire Hobson, Liz Uttley. Hemel Town candidates - Joe Toovey & Steve Wilson. Highfield Candidates - Sammy Barry & Brenda LInk. Other candidates (Dacorum Council Website). Cllr Adrian England (Borough Council Website). Cllr Brenda Link (Borough Council Website). Cllr Ron Tindall (County Council Website). Cllr Ron Tindall (Borough Council Website). Constitution of Hemel Lib Dems. Dacorum Lib Dem Candidate Application from fro 2019 local elections. Dacorum Lib Dem Council Group Standing Orders (Group Rules). Labour were pushed to third place as the Lib Dem vote soared landing them second place with a swing of 14.8% in last nights by-election in Goffs Oak and Bury Green. The Conservatives held on to the seat following the passing of respected County Council Leader Robert Gordon. However, the Conservative vote was down 5.5%, along with Labour at 0.8%. No UKIP candidate stood this time round. David's campaign centred around four keys issues: better intergration of health and social care, challenging poor housing developments in the area, securing better funding for local schools and opposing the County Council plan to build an incinerator in Hoddesdon. He has lived in the borough for over forty years and has pledged alongside Broxbourne Liberal Democrats to keep fighting these important issues. 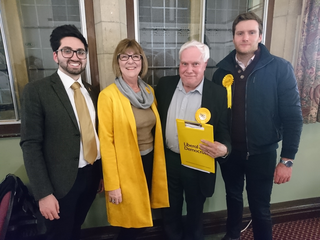 Liberal Democrat County Council Leader Stephen Giles-Medhurst congratulated the team, saying "David and the team have worked hard to draw attention to the concerns affecting the lives of Broxbourne residents. The results show the growing discontent with how local services are being managed. Good luck with the upcoming local elections in May".